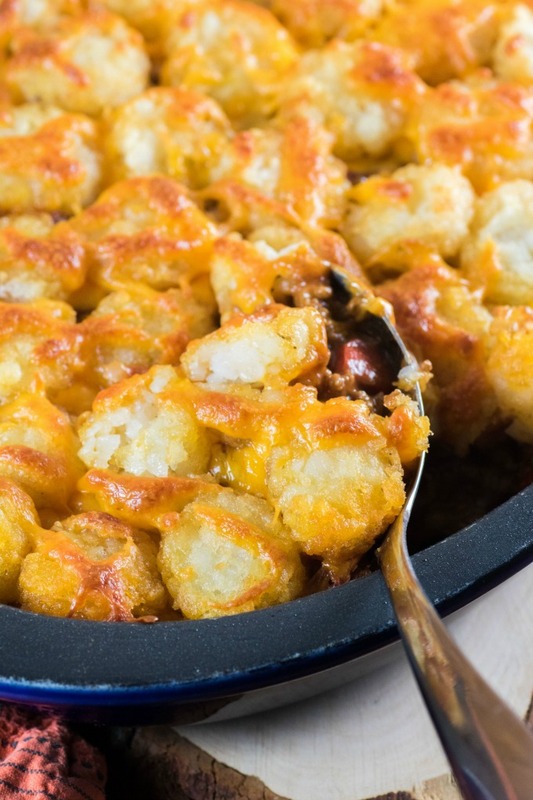 This Tater Tot Sloppy Joe Casserole is a family feast that young and old will love. 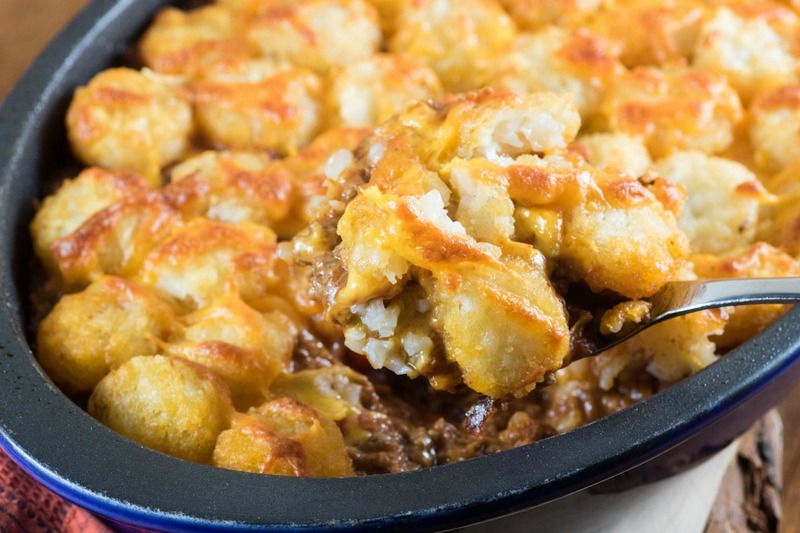 It is very easy to make with a delicious bottom of Sloppy Joe mixture, (I did a recipe already in our slow cooker) and a scrumptious topping of tater tots and melty cheddar cheese. What is not to love about that?!! I love a good ole family meal like Sloppy Joes!! This recipe is an American creation. 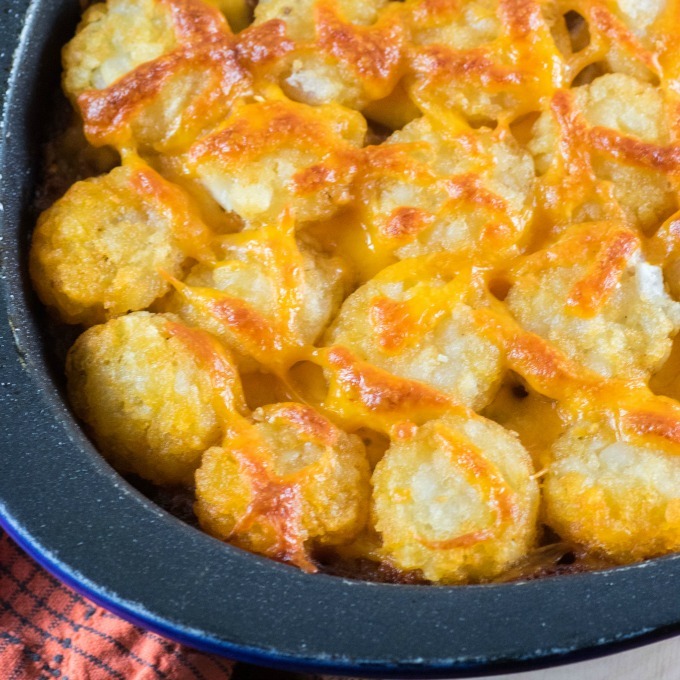 Our daughter is a hash brown freak, so I knew she would love this casserole. Easy weeknight recipes are the best and something that your family will love to come home too. Tater tots may not be the healthiest of choices but really you only have a scoop of them with the wonderful homemade Sloppy Joe mixture. No harm in that!! 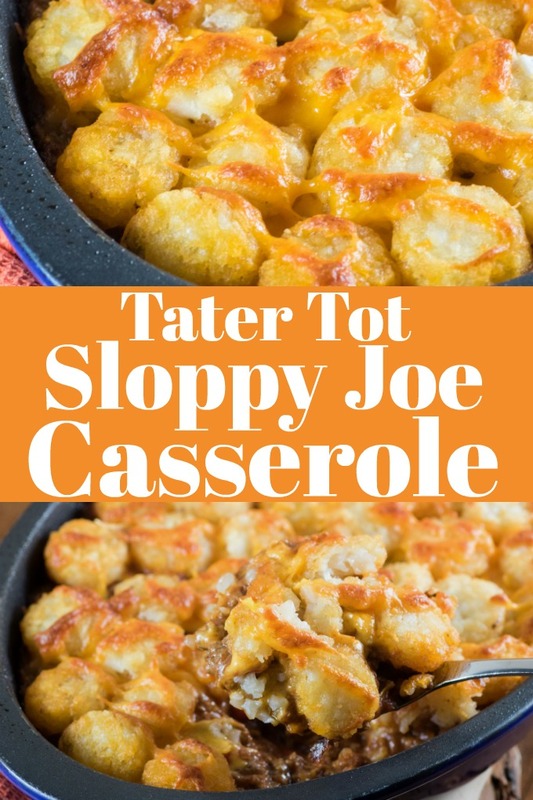 Some Sloppy Joe Casserole recipes have a cornbread, biscuit, crescent roll or Bisquick crust but I loved the ease of the Tater Tots. Actually the package that we got were called Tater Crisps. They are crispier tater tots than the normal ones. Sometimes they even have a noodle or macaroni added into them but I had done that with our Easy Mac Chili Dinner. I wanted to try something new so I thought the Tater Tot crust would be fun for everyone!! It is a great twist on a childhood classic. I liked making the sauce from scratch, it doesn’t take much to make a homemade “Manwich” sauce at all. Let me tell you how, continue reading. It is a simple concoction of ground beef, red bell pepper and onion. Then the sauce is made up of ketchup, tomato sauce, brown sugar, apple cider vinegar, yellow mustard, worcestershire sauce, garlic powder, chili powder and salt and pepper. The mixture is then thickened with a flour and water slurry. If you would like to keep it gluten free you can do a slurry of cornstarch and water instead. Also available are gluten free tater tots but you would have to check to see if your local grocery store carries them. Rich, full on flavor beefy sauce is topped with cheese, then tater tots and then more cheese. Good comfort food at its best for the month of February where we are having a deep freeze at the moment. Cook the casserole recipe until you start to see bubbles around the sides and the top is golden brown. I know a lot of North America has been having a colder and more brutal winter than normal and all we want is to stay at home, keep warm and enjoy some great easy dinners with family. This one needs to be put on your list of next to make recipes. Can You Freeze Sloppy Joe Casserole? Can you freeze a sloppy joe casserole? I would say 100% yes!! I don’t think I would add the tater tots and cheese though. Save them to go on right before it goes into the oven. Then there is no chance of them being soggy. If the sloppy joe mixture was warm at all and you covered it up with the tater tots on top they could start to defrost and become soggy. Just have them in the freezer all together if you are wanting to freeze them. You could even have the cheese grated and in a bag and ready to go. Also according to Wonderopolis there are other names for Sloppy Joes. They are called barbecues, dynamites, gulash, sloppy janes, slushburgers, steamers, wimpies, and yum yums. What do you call sloppy joes where you live? In Canada I have only heard them called Sloppy Joes or maybe a Manwich using the trademark name of the seasoned tomato sauce that you add to ground beef. Sometimes a casserole is hard to come up with a side to serve with. You don’t need another carb or potato. I serve a nice big fresh salad with Sloppy Joe casserole. All the casserole is lacking really is more vegetables to make it a meal on its own. This meal will be a hit with kids as they love Sloppy Joes and they love tater tots. It could convert a picky eater to start to try some different things. 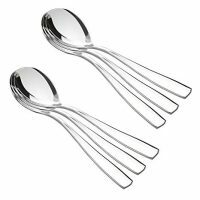 Once their taste buds come alive in a good way trying something like this they may want to venture into other dishes too. Don’t feel like a salad? Some fresh or frozen veggies like green beans, corn, peas, carrots would go great with this too. Try it, enjoy and stay warm this winter. 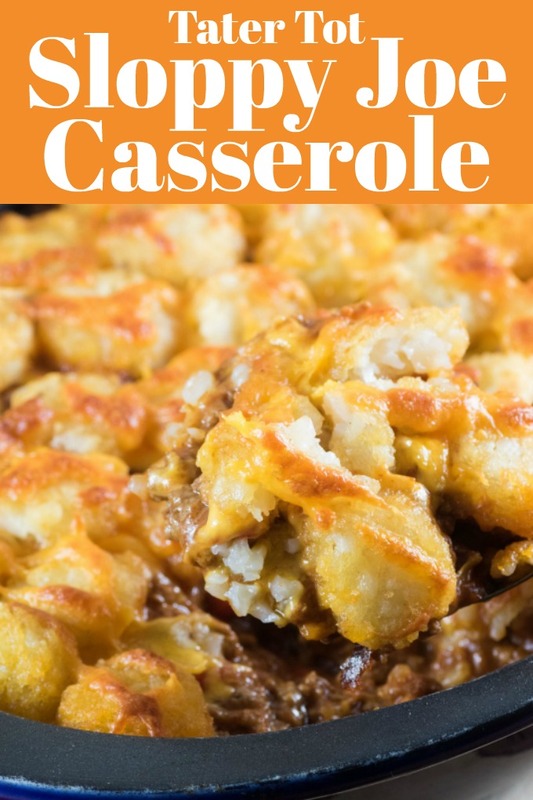 This Tater Tot Sloppy Joe Casserole is a family hit at our house and I am sure it will be at yours. It is a great twist on a classic recipe from your childhood. In a large skillet over medium heat add the ground beef and break up with a wooden spoon. Add in the onion and red peppers and cook until the onions are transparent and the meat is cooked through. Meanwhile mix together the Sloppy Joe sauce. Stir it into the cooked meat and let simmer and thicken while you stir. Place into an 8x11" or oval casserole. Top with 1/2 the cheese, then the tater tots in a single layer and then the rest of the cheese. Yes! I’ve said it before, and I’ll say it again. 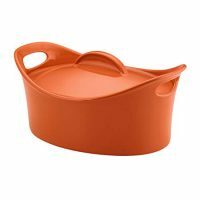 Anything that can be convereted to a casserole, should be converted to a casserole. I can’t wait to make this! OMG this is epic. I love tater tots and I love sloppy joes. You just gave me a yummy meal to make this month. I love to eat sloppy joe. Especially with cheese. 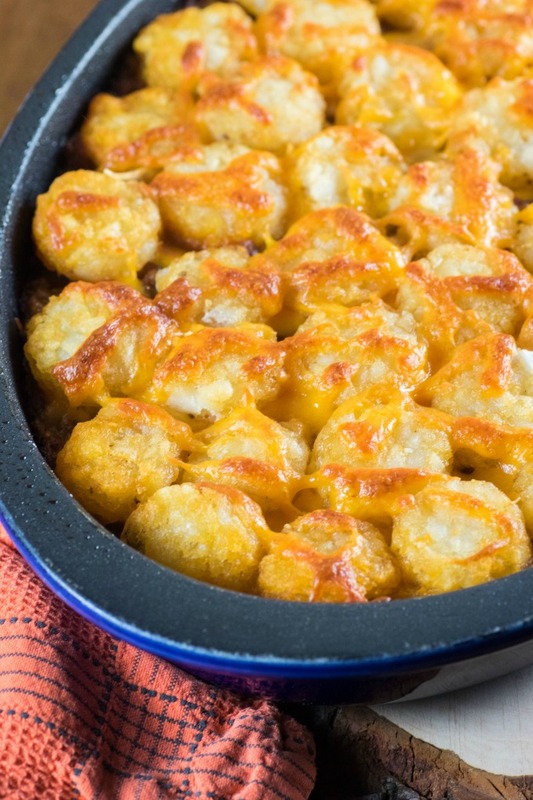 I love the idea of this casserole because it will have some crunch to it. I think it would be pretty filling too. 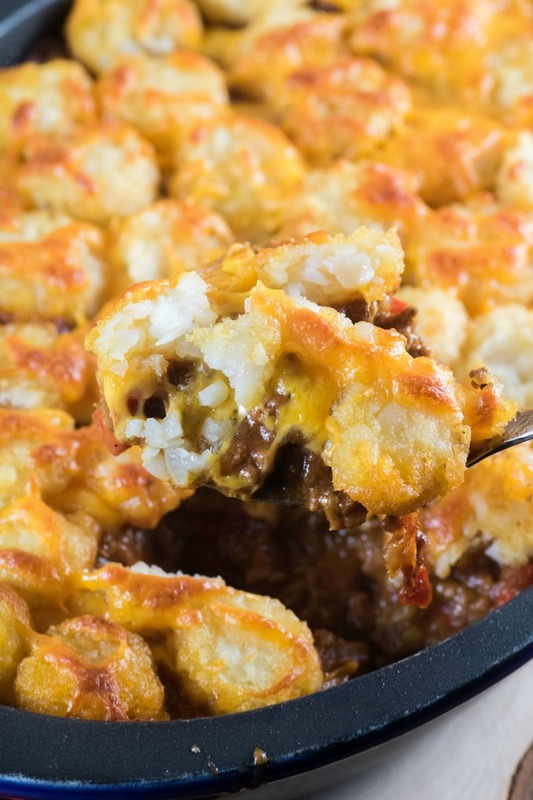 Mixing 2 greats together into a casserole is genius. I love tater tots and sloppy joes. This is an excellent recipe. OH my kids would LOVE this!!!! I so need to try this for them! I think my family will go crazy over this casserole. I love that is hearty and easy to make. The perfect weeknight dinner idea! I am so tempted to make this today. Looks so yummy! 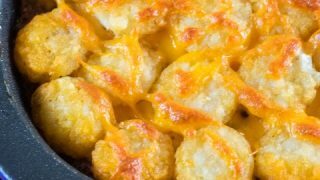 I have never had a tater tot casserole. I have been tempted a few times but never did it. This looks good and savory though. Looks so delicious! Using tater tots would bring out the kid in all of us! I will have to make this the soonest. Adding it to my menu plan for next week.